I only learned his name last week, when we happened to pass each other on the sidewalk. I glanced down at his name tag. 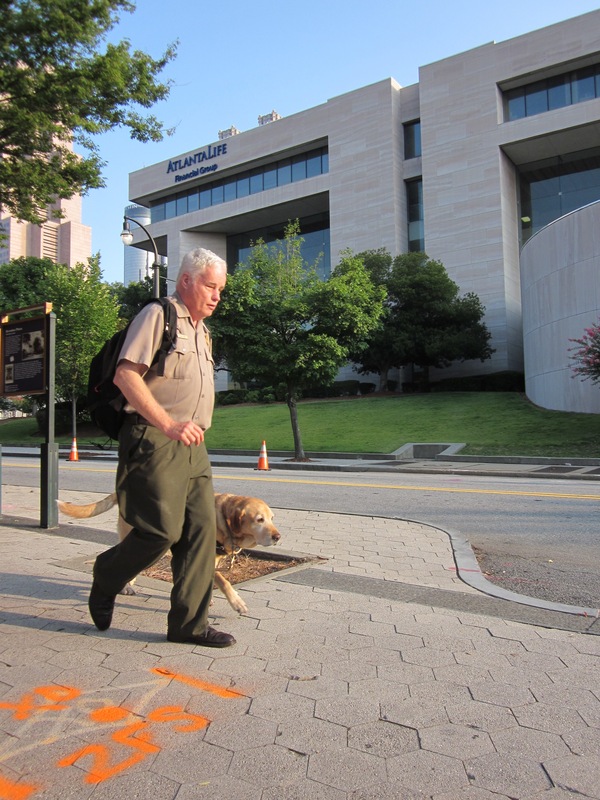 For four years now I have seen Doug and his dog trotting to or from the MLK, Jr. site; occasionally on the train, if I take it; or waiting at corners for traffic to pass. Never walking: always trotting, a slow jog. Since I have seen them on the train, I imagine they get off at Peachtree Center or Five Points, just over a mile away. I haven’t wanted to know more about them, because I simply enjoy seeing them. They remind me of my mother and her service dog. They seem like two buddies just heading to the office. They are for me as much a part of that historic, varied and interesting streetscape as anything else. If you visit Atlanta, make certain you check out Auburn Avenue. Go to the MLK, Jr. National Historic Site, the Ebenezer Baptist Church and the King Center, walk the Freedom Walk. And if you see Doug, say hello. I see him frequently enough that I always sort of want to say hello as I ride by. Nice little look at him, thanks for sharing! Abby! I also want to, yet I refrain, and I am uncertain why. I say hello to all the other regulars on Auburn and Edgewood — the guys selling watermelon across from the Odd Fellows building; the folks hanging around the incense store; speed trap officers astride their motorcycles — so why not him? Next time I see him, I will say hello for both of us, Abby. I went to college with Doug and believe me, he was more awesome then than what your picture reflects today. Then, he didn’t have a service dog and he manuevered the in-town campus with great agility, sometimes with a folding cane, sometimes not. And he would cross the streets as deftly mid-block as he did at the street corners. Just an amazing and personable guy. You KNOW Doug Coyle?? My little voyeuristic world is crumbling, in a wonderful way. I think he would make a great segment on WABE’s “Atlanta Sounds,” don’t you?